The self-publishing world is, truth be told, about the fifth layer of hell for me most days. The pricing is often out of whack--especially given the quality of most print jobs. Though, to be fair, the quality is improving. But all is not lost in this game. I'd guess most stores have a few major success stories with self-published work. Mostly, again I'm guessing, those books that succeed have a local angle or flavor. That alone isn't enough. You also need to have an author who is willing to do a lot of work; be their own publicity machine and network to friends and family and anywhere else they can. Above all, the book needs to be well-written and edited in a careful manner. That seems like it should go without saying but, believe me, it sadly does not. This week we're happy to have one of these bright spots reading at Micawber's. 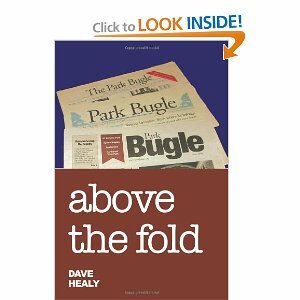 Dave Healy, former editor of the Park Bugle will read from his new collection of essays and editorials from the paper. "Above the Fold" is the collection he recently put together and it's different from most self-published work in that it has already been through editing and even actually been published. Dave is a quiet sort of man in person, so it was always a little surprising to read a voice with such authority on the page. His editorials were local, of course, but they almost always opened themselves to larger questions. His wit and sense of curiosity always present. His pieces, like the best of this kind of writing, seem to take the author out of the equation. It is a public voice written by an individual. We're very happy to provide the 'launch' for his book and look forward to having him with us in the store. Sorry for the Amazon image but it's the only one I could get with decent resolution.